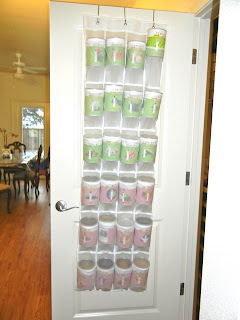 I have always been interested in how other people creatively store food storage, so when I saw this post by Dani I was excited. I pined it on pinterest and it is one of my most popular repins. 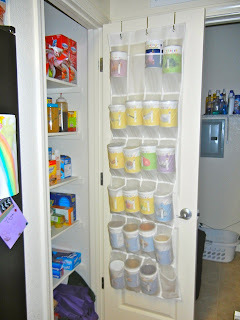 Dani’s idea to use a shoe holder to help organize her food storage is cleaver, practical and affordable. I contacted Dani to see if I could do a feature on her, when she wrote back I knew that she struggled with the same issues many of us do. She has little space, and can NOT make any changes to the home she lives in. Dani is a proud military spouse & has spent the last 10 years following her sweetheart around the world while he serves our country. Every base they have ever been stationed at, they have lived on base housing. They never know what it's going to look like, how many rooms it will have, or where they will be able to store ANYTHING. In military housing they are NOT allowed to do any changes or adjustments to the houses. No painting, no shelving, no adjustments, NOTHING. It makes things very difficult, but Dani and her husband I have become pros at making do with what is given to them. The have been stationed in Monterey, CA for a year now & have one year left here (then they'll be off on their next adventure). Their home here is barely big enough for Dani, her husband and their 5 young children. Dani purchased a shoe organizer at Target for $7.00 to hang in her closet to help free up some space for clothes. She was getting it all organized and was snacking on a pantry can of the THRIVE Freeze Dried Pineapple (her favorite snack) one day and as she was slipping the shoes into the slots, she accidentally slipped that pantry can into a slot thinking it was a shoe. When she realized what she had done the light bulb went off. Five minutes later she was buying 2 more shoe organizers at Target. Now one hangs over the closet door in my dining area & it holds all of my fruits & veggies. The second one hangs on the door of her kitchen pantry. 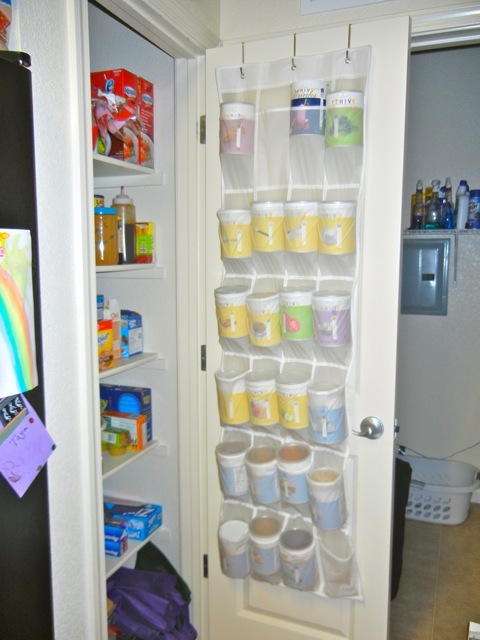 That guy holds yogurts, drink mixes, & baking items (soda, powder, salt, shortening & butter powder, bouillon, etc.) It's FABULOUS. 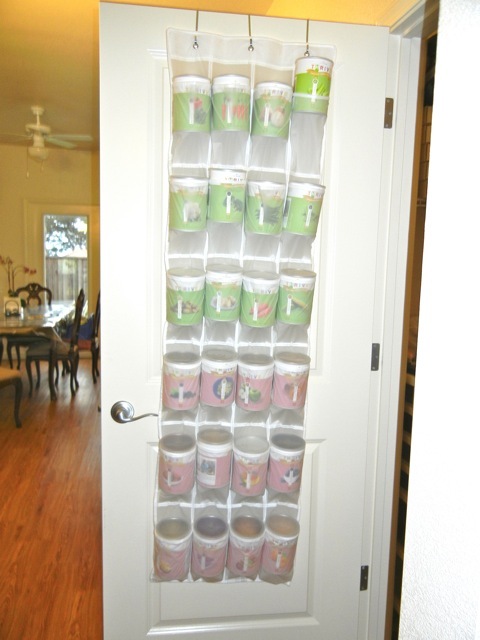 Each organizer holds 24 pantry cans. 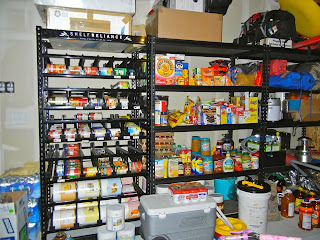 The rest of her food storage is stored in the garage. 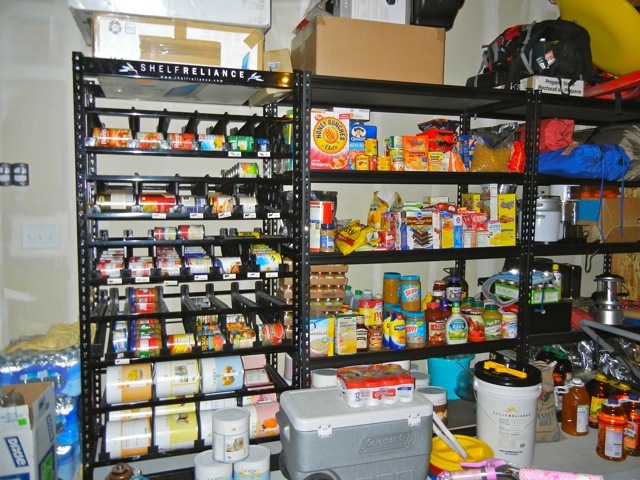 Storing food storage in the garage will not work everywhere, but in Monterey, the weather is so perfect that the garage is a great place to store it. 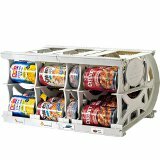 Of course she can't park her van inside, and it's definitely not perfectly organized, but she can fit most of her #10 cans and other cans in her Harvest 72 shelving unit. And then we have 2 other shelves for boxed goods, juices, condiments, and misc. goodies. She also stores 2 of the 55 gallon water tanks in my garage. It's a great way to store it for now until we're off on our next military adventure & then we'll get to "get creative" again with our food storage in a new house. But I'm glad I've discovered the shoe organizer idea because that will work in ANY house on ANY door. 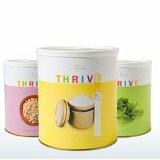 If you have a great place that you store your food storage I would LOVE to know about it. Please fill out the form below. I’d love to share you ingenuity with everyone.